From Wednesday to Sunday the 29th Christian Krug visited the Berlin team. He brought a little remote-control helicopter with camera to take some aerial shots of the excavated areas. He has worked on Lebanese sites before, but it was his first time in Ostia. To make this work possible, Axel had to run about the site, hunting for the best light and wind conditions. With the help of the ground crew all areas were photographed in optimal condition, though sometimes with scary stunts whilst the helicopter reached altitudes of more than 8o meters, almost invisible to our eyes. 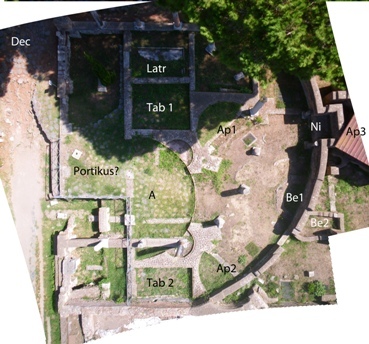 The Berlin team’s work schedule before Christian’s arrival was ambitious: the whole Via della Forica had to be archeologically cleaned and documented, along with the forum portico and the central apse. It could only be managed by suspending days off – but the results satisfied the whole team (see example). Axel tried to photo-rectify and photo-merge all of the pictures after digging and now has a chronic photoshop allergy. 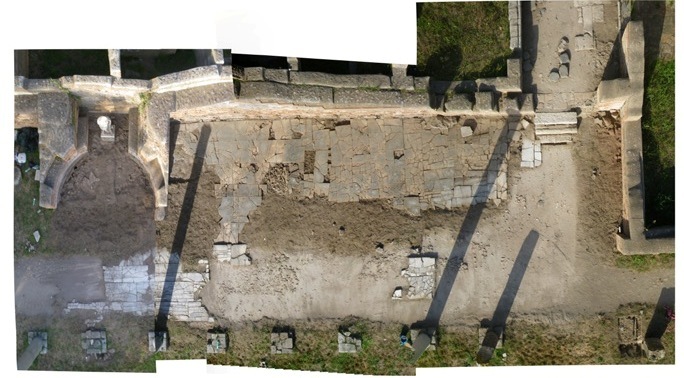 Today Joerdis found another big inscription once used to fill our pavement, along with some architectural parts coming from the temple of Roma and Augustus – we now have proof that our portico-pavement was repaired after this temple had been demolished. Lena and Gunnar started test-pitting the Aula del Buon Pastore. They have found an amazing quantity of high-quality ceramics plus some dice, coins and lots of metal objects, giving the impression we are dealing with a previously unexcavated area. The main apse where a late magistrate could have been sitting was paved with a marble floor where at least traces seem to have survived. The rest of the team was busy in digging the spaces between the columns. Tomorrow, Axel will visit the archives where he will try to get old excavation plans fitting to fit with our new plans and aerial photomosaics: 90 years after Guido Calza we hope to make the first good plans of that area! 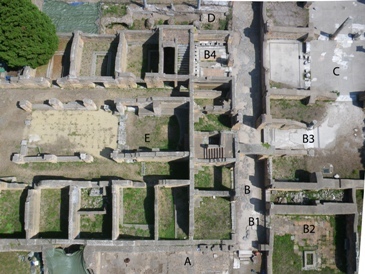 As in the Forum of Pompeii, where this kind of work has been finished only recently, nobody would have believed that the most important spaces of a Roman city like Ostia were never archeologically recorded.